Singing, in and of itself is a joyous and uplifting experience. It taps us into the power of breath and the world of resonance and vibration. I love to sing all kinds of songs and discovered I felt most in harmony when I invited others to sing with me. During performances, healing sound courses, a big choir I led for years or the singing circles I offer now, the same kind of magic would always happen. Science is now showing all the reasons why when people move into their hearts, the stress hormones cortisol and adrenaline lower, and the happy bonding hormones of oxytocin and dopamine rise. I have so much to share about this from years of research and will do so in my next blog. 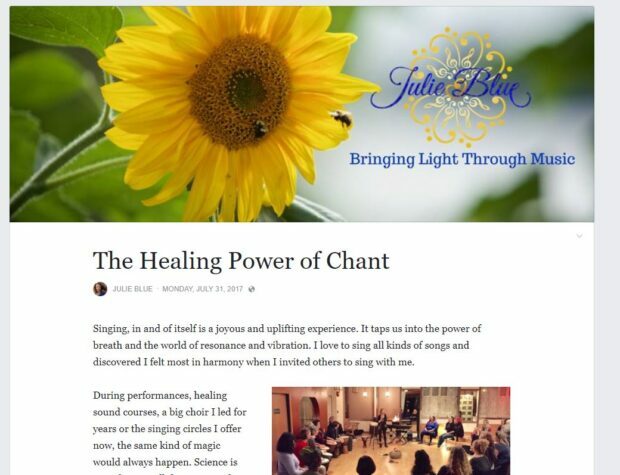 In this blog I want to focus on the healing power of chant. This article originally appeared on Julie’s blog. Read the entire post here. Vedic Chanting Circle Every Tuesday!